Evil strikes when the Quidditch World Cup begins! 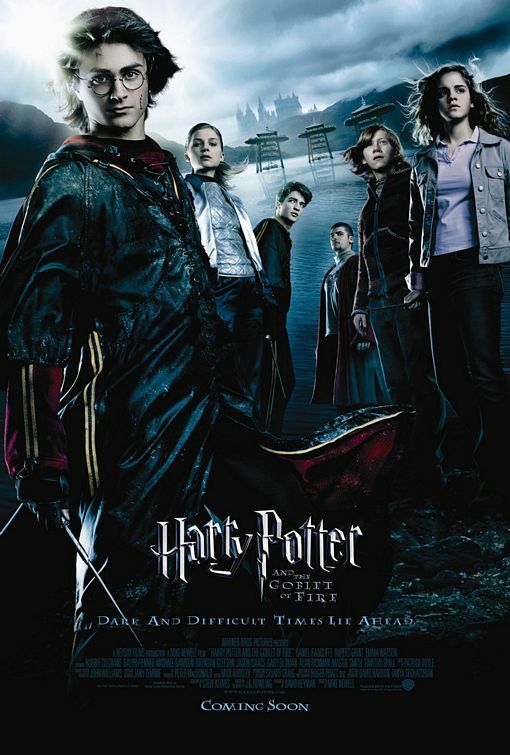 Harry Potter and the Goblet of Fire is the most exhilarating adventure film. The story starts with the finals of the Quidditch World Cup, with the Irish playing against the Bulgarians. At the end of the game there is a Death Eater attack which is the first time Harry sees them and it marks the start of something dark and dangerous which lies ahead. Then comes another year at Hogwarts where they are holding the Triwizard Tournament – a competition between three schools: Hogwarts, Beauxbatons and Durmstrang, who compete against each other in executing three extremely dangerous tasks. There is an age limit of 17 but somehow Harry is entered into the competition and has to compete against three other advanced wizard and witches. Will Harry survive the competition? The Triwizard Tournament is an amazing test of strength and ability in magic and of staying focused on the prize which is eternal glory and fame. For me the highlight of this film is the Quidditch World Cup and I am not alone it seems: all the kids around the world LOVE the idea of Quidditch as a sport and it rightly earned its place on the 50 Greatest Harry Potter Moments; it was placed at 40. That might seem low but there are so many fantastic moments in the films, that in fact, limiting it 50 was quite difficult! The Quidditch stadium looks like an actual stadium where Arsenal would be playing Chelsea, who are two of the most amazing football teams, as are Ireland and Bulgaria in Quidditch. They do a fantastic job of relating it to our daily sport experiences, for example, the stadium itself, the fan merchandise and the enormity of the crowd. A crucial moment not only in the film but also in the whole series is the rebirth of Voldemort which had so much expectation from the fans who had read the book because of the shear horror of his return. The director Mike Newell did a fantastic job of living up to the fans’ expectations. It was not only director but also the special effects technicians who did an amazing job of creating the intense fear when the naked body of a monster is transformed into a man-like monster. The use of blood and fire really enhanced that fear because they are a part of nature that we have neither been able to control nor cope with. Cedric Diggory’s death is terrifying and reminds us of how death affects us all. His part is played by Robert Pattinson who does a wonderful job of acting dead for most of that scene, which is sad because you rarely see Robert playing an innocent character; usually he plays the heroic character in films. The scene where Cedric dies shows us that this is not a children’s fairy tale any more; it’s a serious adult story which builds up into a war of good against evil. Daniel Radcliffe’s acting in the part when he thinks he is going to die is amazing, because his face conveys fear, courage and realisation all at the same time, without him even saying a word. This film is probably one of my favourites out of the Harry Potter films because it shows the actors at their full potential and the impressiveness of the World of Harry Potter.